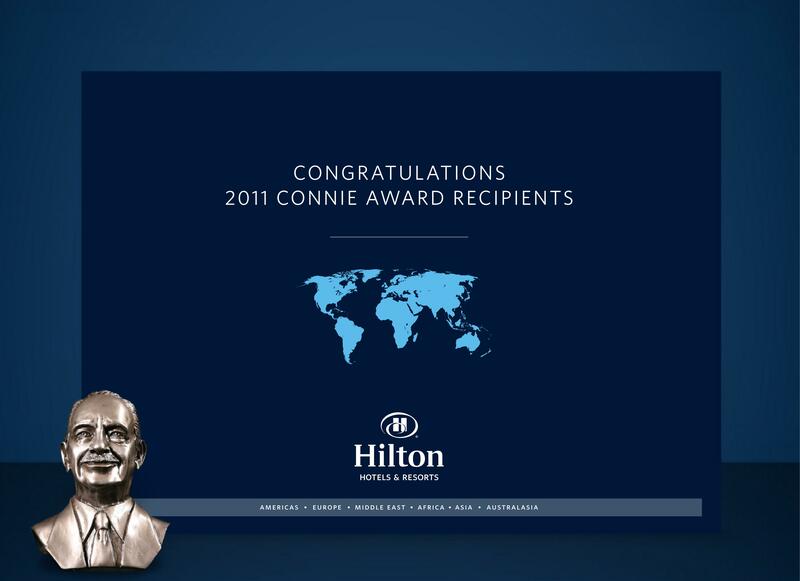 On the final day of Award Week for Hilton Hotels & Resorts, it was just announced that Hilton Orlando Bonnet Creek (as well as our older sibling Hilton Orlando) was awarded the highest honor for the corporation, the Connie Award, named after brand founder Conrad Hilton. This elusive honor, in the large hotel category for the Americas, is awarded to the hotel with highest overall combined ranking for loyalty, service, condition, and cleanliness based on guest feedback and Quality Assurance scores. Congratulations to the entire team for winning the Connie Award, including Peter Kacheris, managing director; and Tracy Walker, general manager. And what a week it’s been! Hilton Orlando Bonnet Creek received the top honors (in the large hotel category) in the categories of Housekeeping (we’ve got the cleanest rooms in the Americas! ), Food & Beverage (our restaurants have been singled out as the most innovative! ), and cultural and community activities (we’ve got Hilton Blue Energy!). The Connie Award simply takes the cake… and (in our eyes) makes it a clean sweep! And, yes, we apologize for bragging. But when a team works this hard, it warms the heart to see such recognition. And you want to share it with anybody who will listen! Please help us to celebrate our success. It has been our pleasure to provide a memorable guest experience for the past year.